Clare Marshall was on the staff of the Colorado School of Mines' Department of Geology and Geological Engineering. She was also a former Junior Girl Scout Troop leader and mother of a Junior Girl Scout in Troop 357 of Lakewood, Colorado. 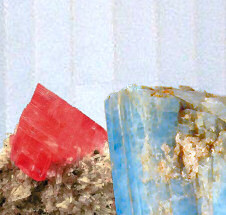 While designing an exhibit for the new Geology Museum at the Colorado School of Mines, Mrs. Marshall noticed that Colorado's official state gemstone, Aquamarine, was blue and the official state mineral, Rhodochrosite, was red. With the addition of a white rock, Colorado could claim a red, white and blue trio of geological symbols as representative of the Centennial State. The idea of red, white and blue geological symbols was passed on to Junior Girl Scout Troop 357 and they reacted with enthusiasm. In October 2002, they jumped into the project with their eye on the "Bronze Award", the highest award Junior Girl Scouts can earn. They spent nearly 150 hours on research, visiting the Yule Marble quarry, earning three merit badges, completing a community service project and getting endorsements from historians, geologists and politicians. 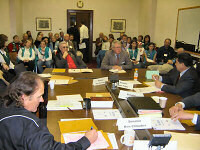 They testified before two legislative committees. Colorado is the Centennial State. Colorado has a red Official State Mineral, rhodochrosite. Colorado has a blue Official State Gemstone, aquamarine. If the state rock were white, the Official Geological symbols would be red, white and blue. The Yule Marble is white. The Yule Marble has been used in many famous buildings and sculptures. The Lincoln Memorial in Washington DC. In the Washington Monument, each state contributed a 20" x 40" rock to line the inside of the monument, and Colorado chose Yule Marble. The Tomb of the Unknowns, currently being renovated, is made of the largest single block of marble produced in the United States. As the state known for the majestic Rocky Mountains, it seems odd that the state does not yet have an official state rock. Only 9 states have 3 geological symbols (rock, gem and mineral), and none of them have the color combination of red, white and blue. Only 4 states have a state rock that matches the rock in the Washington Monument for that state. The Yule Marble is a strong, beautiful rock. It is composed of 99.5&perc; pure calcite. The grain size yields brilliant cleavage sparkles in the unpolished stone. It has lasted almost 100 years in the humid environment of the District of Columbia. The first major use of the Yule Marble was in the Colorado State Capitol building, in 1895. In October 2003, Troop 357 contacted Colorado State Representative Betty Boyd, of Lakewood, to begin the process of getting Yule Marble declared the official state rock of Colorado. Representative Boyd attended a couple of troop meetings and decided that she would sponsor the "state rock" bill. On January 7, 2004 Colorado Representative Betty Boyd introduced House Bill No. 1023 to make Yule Marble the "...state rock of the State of Colorado." She was joined by 27 other Colorado Representatives determined to turn this bill into law. The bill was passed by the Colorado House of Representatives on February 2, 2004 and sent off to the Senate for their approval, where it was introduced the next day. On February 17, 2004, the bill was passed in the Colorado Senate. 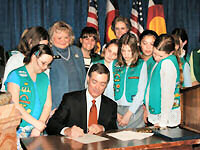 On March 9, 2004, with Girl Scout Troop 357 looking on, Governor Bill Owens signed the legislation declaring Yule Marble the official state rock of the state of Colorado. But before he did, he handed each girl a Girl Scout Bronze Star. A "rock" is a combination of one or more minerals. For example, granite is made up of quartz, mica and feldspar. Colorado's Yule Marble is made up of only one mineral - calcite. The character of the stone is exceptional and is better for sculpting than Michelangelo�s favorite Carrara Marble. It is possible to quarry larger blocks of Yule Marble than most other marbles in the world. The stairs and floors of the Colorado State Capitol Building are made of Yule Marble. The stone was used in the construction of more than 30 buildings in Colorado and more than 100 additional buildings across the country including the Lincoln Memorial and the Tomb of the Unknowns. Its chemical purity, as well as its small and uniform grain size has led to its use in many experiments in rock mechanics. This exceptional marble is named after Yule Creek in the Elkhorn Mountains near the town of Marble, Gunnison County. Yule Creek was named after 1870s resident George Yule. The Treasure Mountain marble deposit was first reported in 1882. Yule Quarry operations began in earnest in 1906. The following information was excerpted from the Colorado Revised Statutes , Title 24, Article 80, Part 9, Section 24-80-912.7. TITLE 24. GOVERNMENT - STATE. ARTICLE 80. STATE HISTORY, ARCHIVES, AND EMBLEMS. PART 9. STATE EMBLEMS AND SYMBOLS. 24-80-912.7. State rock. Yule marble is hereby made and declared to be the state rock of the state of Colorado. Source: L. 2004: Entire section added, p. 76, § 1, effective August 4. Editor's note: This section was contained in a 2004 act that was passed without a safety clause. For further explanation concerning the effective date, see page vii of this volume. Source: Colorado Legislature, January 17, 2005. Source: Colorado Geological Survey, January 17, 2005. Source: Office of the Governor, January 18, 2005. Ordinary limestone turns into Colorado�s State Rock: Yule Marble from the Colorado Geological Survey. Yule Quarry, Marble, Col.: Artist Francisco Sotomayor's views of the Yule Marble Quarry. Colorado Yule Marble: Artist James Goss' Yule Marble Sculpture. 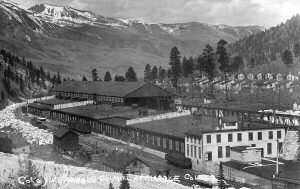 Marble, Colorado: Information about the (ghost) town of Marble, Colorado. Colorado Scenery - Yule Marble Quarry Area: Personal web site - Photographs and commentary. Photographs From Marble: GhostTownGallery.com photographs from Marble, Colorado. 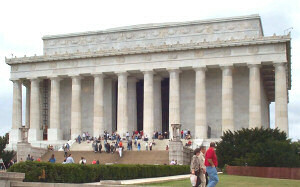 The Lincoln Memorial: The Lincoln Memorial including Design and Construction from the National Park Service. Colorado Yule Marble -- Building Stone of the Lincoln Memorial: U.S. Geological Survey Bulletin 2162 by Elaine S. McGee. The Tomb of the Unknowns: Arlington National Cemetery.